Jason Wu's fan club reads like a who's who of women power players in America: The First Lady, Michelle Obama, has chosen him on multiple extremely important occasions; Diane Kruger often turns to him for her red carpet moments; and then there are Kerry Washington, Jessica Alba, Blake Lively, Emma Stone, Chloë Grace Moretz… You get the picture; the list goes on. Many industry players have long been fascinated by the fact that Taipei-born Mr. Wu's first foray into fashion was, aged 16, via a range of super-luxe clothes for dolls (produced by Integrity Toys and now called the Fashion Royalty collection). But jump ahead to today and there could be nothing more real—and really drop-dead impressive—about Jason's human-sized creations. His deft hands take swathes of satin and chiffon and spin them into ultra-flattering, ultra-feminine pieces that his glamorous roll-call can't help but feel good in. This year has been a big one: Jason married his long-term partner Gustavo Rangel in Tulum, continues to impress everyone with his tenure at Hugo Boss and he's just launched a special collaboration with beauty brand Caudalie—which means we had the opportunity to speak to this now integral part of the glossy American fashion landscape. Keep reading to see our interview with Jason Wu, then keep going to shop his latest wares. WHO WHAT WEAR UK: You really paved your own way in terms of starting out in the industry. Where did that drive and dedication come from? JASON WU: I’ve always wanted to be a designer, for as long as I can remember. My parents really supported and urged me to follow this passion. My mother bought me my first sewing machine when I was nine years old and I just never stopped. She was my first real inspiration, and I always l look up to her. 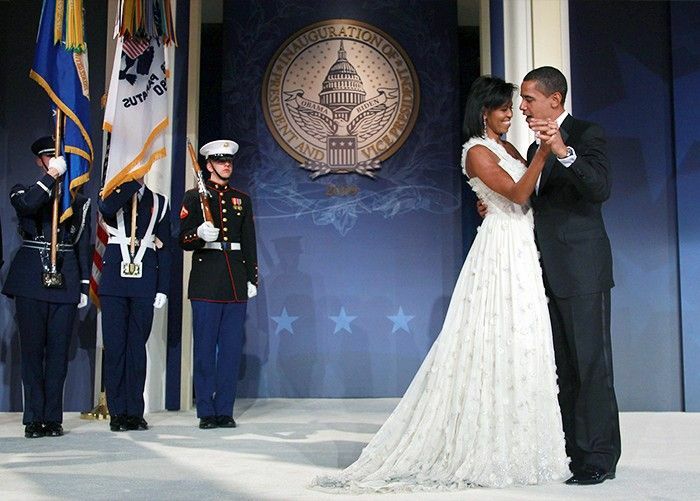 Michelle Obama wearing Jason Wu at the 2009 Inauguration Ball. WWW UK: Can you remember a first moment where you felt you'd really hit a high point? JW: There is no doubt that designing the First Lady’s inaugural gowns has been the single greatest professional and personal accomplishment in my life. The reason that I moved to New York was to pursue a career in fashion, so to be a part of American history through this experience means the world to me. Michelle Obama wearing Jason Wu for the second Inauguration Ball, 2013. WWW UK: Where were you and what you were doing when you found out you'd dressed Michelle Obama for the first time? And how did that come about? JW: It was a very exciting moment. I was working in my studio on the upcoming fall collection I was presenting soon, so I was actually surrounded by my whole team, which was really nice. I was fortunate enough to dress her for President Obama’s second inauguration ball as well. The first time she didn’t make any suggestions on the design, but the second time she was very involved in the design process. It was a lengthy but wonderful process. I am so honoured to have put so much into a dress that is a part of history. WWW UK: As for your other major super-fan, what is it about Diane Kruger that so matches your aesthetic? JW: She has such an intriguing sense of style and a great understanding of fashion. We often work together on red carpet looks; she most recently wore a custom scarlet red abstract houndstooth lace gown to the New York premiere of The Infiltrator. WWW UK: What would you say has changed the most about the industry if you were to start out again in 2016? JW: Fashion has become so much more accessible. Fashion week and runway shows used to be exclusive to people within the industry, but with the rise of social media and influencers, everyone has a front-row seat. It is a really exciting time to be in fashion. WWW UK: What would you say is the biggest mistake budding or aspiring designers make? JW: They focus too much on one signature moment. However, your career is not just about one moment or one hit show. You have to figure out what your next moves are going to be. Longevity is key. Don’t allow yourself to become a “personality.” It is very easy to be swept up and caught by the whirlwind. Use all the resources available to you. Don’t be afraid to reach out to everyone you know until you find the right source. Success is about being uncompromising, dedicated and persuasive. WWW UK: Amazing advice. Thank you, Jason! Michelle Obama wore a full-length gown in this gorgeous fabric recently. This piece has boardroom written all over it. "We worked on many versions of the leaf pattern seen in the lace... The idea grew out of my spring/summer 2016 collection," explains Jason. Head over to Byrdie.co.uk to read more about Mr. Wu's take on beauty. Just about the only backpack chic enough for a New York office. The very same frock Kate Bosworth recently wore. We love a cosy layering tool like this. Which American designers do you love? Let us know in the comments box below.